Microsoft has unveiled a new system of bots that can represent businesses and interact with users via Skype. Social bots are automated programs that can chat to users in a humanlike way. As part of the Build developer conference, Microsoft also revealed updates to digital assistant Cortana, which can interact with bots on the user's behalf. Cortana will now function across various devices and operating systems, like Android and iOS. The tech giant also announced a Skype app for its HoloLens headset. "We want to build intelligence that augments human abilities and experiences," Microsoft chief executive Satya Nadella told the audience at Build in San Francisco. 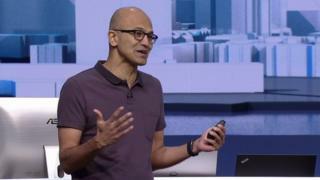 Mr Nadella described Cortana as "a truly unbounded personal assistant that's always with you" as he explained that it would be available across Windows, iOS and Android devices. Just hours earlier, however, an artificial intelligence Twitter bot called Tay created by Microsoft was briefly reactivated and began spewing nonsensical tweets. Mr Nadella acknowledged problems with the bot and said, "we are back to the drawing board". Lilian Rincon, Skype group program manager, proceeded to demonstrate how automated online bots could interact with Cortana during a text conversation in Skype. "Right away what you're seeing here is that the agent, Cortana, is actually brokering the conversation with the third party bot," she explained, as Cortana finalised details of a product delivery. The app could also, for example, listen in to a conversation between friends about a trip and then suggest introducing a bot representing a local hotel. Booking could then be carried out as though a conversation were taking place between the user and a sales representative. "Microsoft is integrating its Cortana and deep learning capabilities into a platform that will span everything from Skype to Outlook and across devices," analyst at CCS Insight Geoff Blaber told the BBC. "This is Microsoft trying to establish the next platform, having missed mobile." Chris Green, a tech expert at consultancy Lewis, said the developments are likely intended to increase the availability of Cortana to more users on more systems and so increase the app's "stickiness". "That concept of stickiness is quite important, it's about forming that bond between user and system - it's critical to achieve long term usability," he told the BBC. The firm also reiterated that its HoloLens augmented reality headset, which was unexpectedly announced at Build last year, would begin shipping to developers. An announcement to this effect had already been made on Microsoft's Windows blog in February. Applications showcasing how HoloLens could be used to, for example, teach students about human anatomy - with 'holographic' illustrations of organ systems visible in 3D to headset-wearers. This time last year Satya Nadella was gearing up for a massive launch - Windows 10. For the first time, the operating system would be free. The goal - get it on as many devices as possible, because then the real fun can begin. More than 270 million Windows 10 devices later, it's time to see what it can do. At Build 2016, the excitement is around AI and AR. AI - artificial intelligence - has an only-slightly-joking reputation as being the tech that will potentially bring about the end of humanity as we know it. But it's not "man versus machine", Mr Nadella said, but "human with machine". He said bots are the new apps, and to demonstrate, Microsoft's Cortana assistant is breaking out - it's being integrated into other programmes like Skype. The aim here is to have this omnipresent assistant that grows smarter over time. AR - augmented reality - is now ready for developers. The first HoloLens headsets are being sent out, and with it the promise of computing experiences we've never before imagined, for education, enterprise and entertainment. But it must be said, the on-screen demos of HoloLens are fantastical compared to what the device can actually do today. As Windows 10 was being launched, people asked if Microsoft would be able to drag itself back into relevancy. Today's show of AI and AR proves they've surpassed that. Microsoft is exciting again.